I recently made 'the switch', not the switch from analogue to digital TV, but from Sky to Freesat. I thought saving £30 a month for just TV (just TV!, not including phone and broadband) would be a snap. I already had a dish, I thought that there were more/better channels on Freesat than Freeview. So I bought the Humax Foxsat 500G (£250), thought I'd get a good box, as I didn't want to feel like I was in the dark ages after using a Sky HD box. 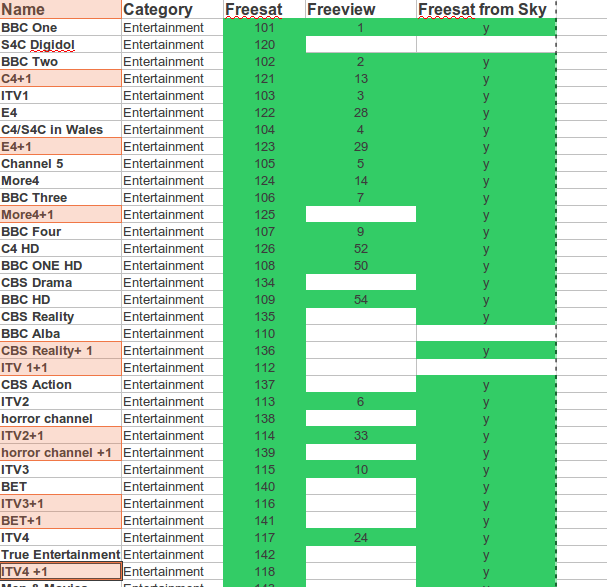 However, I was totally taken by surprise by the rubbish selection of channels on Freesat. I can't believe that after searching around the net and talking to friends and shop assistants, that no one had pointed out that there are major channels missing from the line-up. The kicker is that I then found out that Freesat from sky with an HD box (although I'm not sure it records) is only £175! Or I can buy the viewing card for a one-off £25 quid and I could use it in my current Sky HD box, although again I'm not sure I can use the PVR features. Note: I'm not including radio channels as I think using a television + PVR to listen to radio is in sanely inefficient. 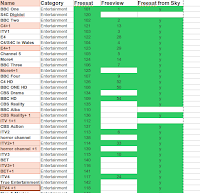 Freesat has 14 +1 channels 11 of which are the entertainment channels. That's 11 out of 35 are a plus one! which may not sound bad, but if you have a PVR, they fairly useless. I've sent a complaint to Freesat already, now to make a phone call to Sky, and to figure out if the Sky card will work in my Humax box.